Dino-Lite is now the worldwide market leader and industry standard for digital handheld microscopes. Dino-Lite AM5018MZTL: directly connected to HDTV or LCD monitors. Sharp and vibrant HD 720p resolution to display even the smallest details. Dino-Lite AD4013MZTL: long working distance, polarization filter and a third (exchangeable) polarization cap as well as aluminum alloy housing. Dino-Lite AM4115ZTL: Wide range of magnification (10-140x), large field of view and working distance up to 23 cm. High-end stand solution RK-10: for all Dino-Lite models. Made of resilient stainless steel and lightweight aluminum. Very precise fine-focus adjustment. WiFi Streamer WF-10: to use Dino-Lite USB models wirelessly in connection with iOS (iPhone/iPad) or Android app on any tablet, smartphone or computer. 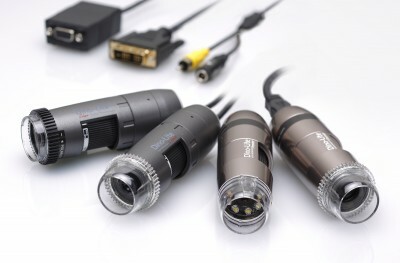 With over 150 models, the Dino-Lite range offers a solution for every application including USB, TV, VGA, plus ultraviolet and infrared illumination, and numerous magnification ranges. For details of the whole range please visit www.dino-lite.info.